Honoured: Fr Leo Donnelly receives the citation accompanying the award from Brian and Lesley Tierney. GRATITUDE and good-wishes flowed for retiring parish priest Fr Leo Donnelly, who was presented a major Papal Award by Lismore Bishop Greg Homeming at a Mass held at St Agnes’ Parish on March 23. The same Mass installed the new parish priest, Fr Paul Gooley. The Croce Pro Ecclesia et Pontifice (the Cross for the Church and Pontiff) was established in 1888 by Pope Leo XIII and honours distinguished service to the Church and is only awarded by the Pope. Tom and Terry Quinn and Brian and Lesley Tierney presented the award alongside the Bishop, who were all closely involved with ‘Father D’, as he’s known, during his tenure as parish priest. Parishioner Jim O’Brien expressed his gratitude on behalf of the parish for Fr Donnelly, who retired after 48 years of service as parish priest. “As a parish, we are pleased that Father D has the opportunity to finally retire in his own time,” Mr O’Brien said. “We are delighted that a wonderful priest in Fr Paul Gooley has been appointed as Father D’s successor and share Father D’s confidence in him. “We will miss having Father D as our leader and pastor as he is the only (parish priest) most of us have known in Port Macquarie. “During his nearly five decades as (parish priest), Father D has led the transformation of this Parish into an amazing complex of service and education entities that touch the lives of thousands from the youngest to the oldest residents of the Port Macquarie Hastings area. 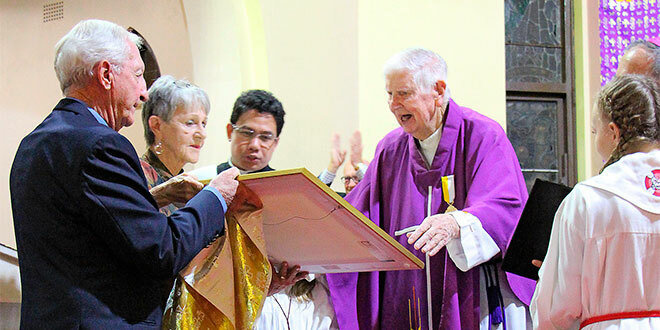 Bishop Homeming said the Croce Pro Ecclesia et Pontifice was a fitting testament to Fr Donnelly’s commitment to the parish and the diocese, having served as a priest for the past 68 years. “The true measure of Father Donnelly’s commitment is not in time but through his actions,” Bishop Homeming said. “Father D is a pastor whose love for his parish has been so evident. Fr Donnelly credited many others with the achievements of St Agnes’ Parish. “I can think of no greater privilege than to be called to lead a faith community, but with that comes the responsibility to do your very best for the people of that community,” he said. “Looking back, I think we can claim that, together, we have kicked a few goals. Fr Gooley came to St Agnes’ Parish with the skills and know-how of the local region, having spent the last ten years in Macleay Valley Parish, Kempsey and the previous ten at Our Lady of Lourdes Parish, Wauchope as parish priest. “I was assistant priest to Father Donnelly at St Agnes’ Parish from 1990 to 1995 so it feels like I have come full circle,” he said. “Father Donnelly and I have been firm friends since that time and I am pleased that he now has the opportunity to slow down a bit. St Agnes’ chief executive officer Adam Spencer said no one deserved the blessings of a peaceful retirement more than Fr Donnelly. “Our parish is fortunate that a man of Father Paul’s calibre has been appointed as Father D’s successor – he will be a great asset to the parish,” he said. “I look forward to working closely with Father Paul to serve the needs of our parish and the community.” Fr Donnelly has retired close by at The Francis Retreat in Bonny Hills.